With politics at their most head-scratching on display in our nation’s capital, we were reminded to refocus on the fundamentals by that non-partisan beacon of quizzing, HQ Trivia this past Sunday. Specifically, we were asked to remember which word was NOT a part of the Pledge of Allegiance: Freedom, Justice, or Republic. Take a moment, but no more than 10 seconds. One of the benefits of an independent platform is the FREEDOM (see what we did there?) for us to concentrate on areas where we think our perspective and data-driven nerdliness can make a difference. CVS/AET has been a major topic since our 12/1 launch – and we’re proud of the depth on display in our 7 part (so far) series we’ve done on the topic. In parts 6 and 7 published Jan. 19th we revisited outlooks for CVS and AET shares. Lots of detailed explanation in the note (spoiler alert: We make the case that it is reasonable for AET to trade UP on deal break – seriously). 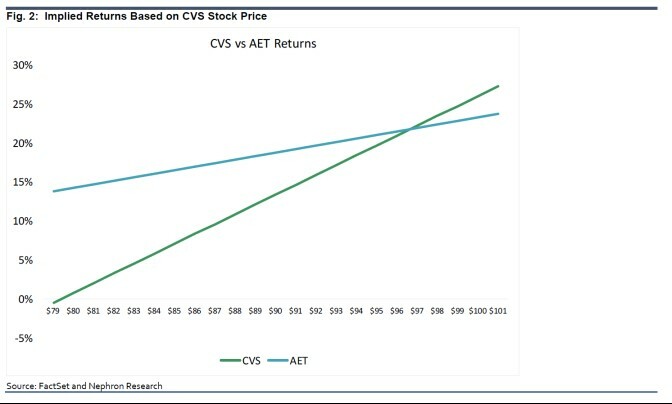 The bottom line is that we’ll take Aetna over CVS (in the near-term) if you think the transaction has a better than 25% chance of completion by year end even with CVS at $95 (we view those odds as too low). Taken at a different angle, a flat CVS from here gives us an implied probability of deal close at 34%. Again, we think that is too low.